There are some numbers that follow us around for much of our adult lives – our Social Security number, shoe size, and, for better or worse, our credit score. The first two are permanent (barring something really bad happening), but our credit score is dynamic, subject to constant change as we navigate the financial ebbs and flows of our lives. Good or excellent credit scores are the keys to the (consumer) kingdom, but a poor one can cast you into the financial wilderness. Let’s learn more. A credit score is a number that encapsulates your financial history. It indicates your creditworthiness in light of your record of borrowing, missed repayments, bankruptcies, foreclosures, court judgements, and many other relevant factors. The most commonly used credit score is known as the FICO score, invented by the Fair Isaac Company. It ranges from 300 (the worst) to 850 (the best). Scores between 701 and 759 are considered good. Credit Payment History (determines 35 percent of your score): A potential lender or creditor wants to know how you’ve met your repayment responsibilities in the past. A good history reassures creditors, but past indiscretions, such as collections, defaults, bankruptcies, etc., will drop your score by dozens or hundreds of points. Over time, negative items lose their impact, but can linger on your credit report for up to 10 years. Amounts Owed (30 percent): Creditors look at your utilization ratio, which is the amount of credit you’re using divided by the credit available to you. Ratios above 30 to 40 percent are considered high and will hurt your score. Length of Credit History (15 percent): Creditors can get a better handle on your creditworthiness if you have a long history. New Credit (10 percent): Creditors look at how often you apply for new credit and the number of credit inquiries you’ve recently had. Credit Mix (10 percent): You can achieve a higher score if you have a mix of revolving and non-revolving accounts. The numbers reflect a trend of improving scores over the last six years. Only 20.7 percent of consumers have bad credit, whereas 55.8 percent have good or excellent credit. While most of the trend represents an improving economy and job picture, some of it may also reflect folks “dropping out” of credit usage. The average FICO score was 699, an all-time high, nearly 10 points higher than it was in the days of 2006, just prior to the Great Recession. 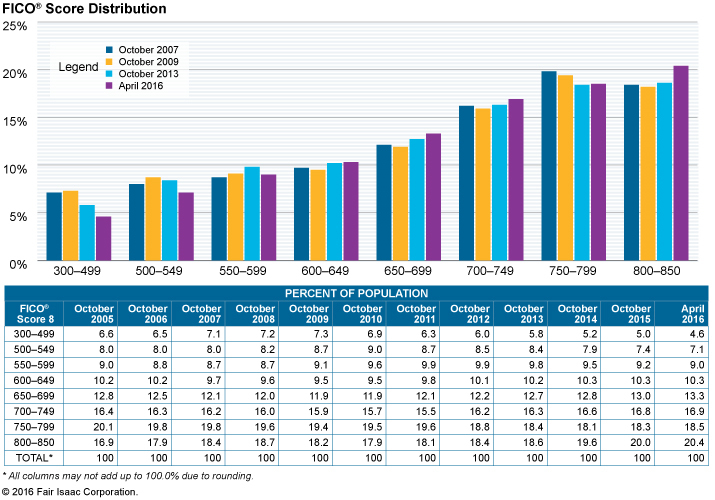 The average score bottomed out in October 2009 at 686. The improving trend of scores coincides with a falling rate of delinquencies, defined as payments that are 90+ days past due. For all credit accounts combined in the previous two years, 17.1 percent of consumers were delinquent as of April 2016. Compare this to the October 2013 figure of 19.4 percent. Recall that payment history drives 35 percent of the total FICO score, which explains the reverse correlation between delinquencies and FICO scores. This range, also called “subprime” reflects a consumer’s so-called “bad-behavior,” which (broadly speaking) occurs when you fail to honor a credit agreement. Being late and missing payments, as well as defaulting on a debt, is bad behavior. Bankruptcies, collections, and foreclosures are very bad, and can drop your score by hundreds of points. Consistently making only minimum credit card payments is less dramatic but still harmful, and when combined with a high debt-to-income ratio, warns creditors that you might have trouble keeping up with your payments. If you are having troubles managing your debts, it’s imperative that you alert your creditors and ask to make new arrangements, such as a longer time to repay or a lower interest rate. If you are facing bankruptcy, some lenders might be willing to forgive part of your debt in order to avoid time-consuming and costly court proceedings. If you have bad credit, you probably have little or no access to credit, and even if you can gain access, you’ll be saddled with sky-high interest rates. Folks with bad credit often turn to payday loans when they want to borrow money, creating the potential of falling into a debt trap of unending repayments. Fair credit isn’t so bad. Rather it’s at or just below average. You can land in this category by several routes. For example, you might attain a fair score by cleaning up your act — reducing your debt and avoiding late payments — thereby climbing out of the bad-score group. You also might improve from a bad score with the passage of time following a default or bankruptcy. On the other hand, you might fall from the good to the fair category if you have a record of late payments and taking on too much debt. Usually, consumers with fair credit scores can access credit, though high interest rates and limited credit lines can hamper this group. Folks with fair credit will probably be limited to credit cards with average rewards, but should avoid cards specifically designed for consumers with bad credit. They shouldn’t expect to qualify for cards that offer huge sign-up bonuses or zero percent promotions. Consumers with fair credit are best served by using credit sparingly, paying bills on time, and if possible, paying off the entire balance each month. Good habits should help you boost your score into a range that is better. Approximately 17 percent of consumers fall into the good credit score category. Very few consumers in this range default on their loans. Climbing into the good-score range opens up new borrowing possibilities. For example, it’s much easier to attract a peer-to-peer (P2P) personal-loan provider if your credit score is good or better. A personal loan, sometimes called a signature loan, is not collateralized, which means lenders require borrowers to be creditworthy. By contrast, consumers with fair or poor credit might not qualify for a non-collateralized loan. There is absolutely no reason for someone with a good credit score to borrow money via a payday loan because a credit card advance is easier and less expensive, as is a personal loan. If you have good credit and you have equity in your home, you probably qualify for a home equity line of credit, which is a revolving credit account backed by your home. With these loans, you pay only for the credit you use, and can reuse money you’ve borrowed and repaid. If you never borrow from the line, you never have to pay any interest. If for some reason you prefer to take a private student loan instead of a federal one, having a good score will probably make it easier to qualify. Unlike federal loans, private student loans are partly predicated on your credit score and history. The world is your oyster when you have an excellent credit score. You likely have an almost spotless credit history and an above average income. You might not think twice about paying annual fees of several hundred dollars to get credit cards that pamper you with dozens of benefits and rewards. The top cards might offer 50,000 or more bonus miles when you spend a set amount of money within the first three months. These cards feature premium perks, like various types of free travel insurance and no foreign currency charges. You can also easily qualify for charge cards that have unlimited spending limits. With these cards, you pay the balance in full each month, avoiding interest charges completely. Banks welcome potential borrowers with excellent credit, offering them the prime interest rate on personal loans and mortgages. If you have excellent credit, you will have access to special car leases and loans available only to very qualified customers. For the approximately 40 percent of consumers with a credit score above 750, obtaining credit should not present a problem. A good credit score is an important financial asset. Let’s see why. If you’ve ever had bad or fair credit, you know how frustrating it can be to get a good credit card or loan. Good scorers can access all but the very best interest rates. They can qualify for credit cards that provide very nice benefits and comfortable maximum spending limits. Banks will usually be happy to offer you a mortgage, and automakers will go out of their ways to provide you with reasonably-priced financing for auto loans or leases. Having said that, you should not assume that a good credit score is all you require to access credit, because other factors can also come into play. For example, you might have earned a good score, but then lost your job. Your score will not plummet right away, yet lenders might be shy about offering you a loan if you are between jobs. Having access to credit also means you will be able to borrow more. You will qualify for larger loans and higher credit card limits. You will find it easier to qualify for a mortgage or a home equity line of credit. You’ll also have more luck securing a peer-to-peer personal loan, in which individuals lend money to borrowers mediated by a P2P website. Not only can you access more credit by virtue of having a good score, you’ll also be able to get better interest rates on your credit cards and loans. While it’s true that the very best rates are reserved for those with excellent credit, the rates for consumers with good scores are not shabby. Compared to folks with fair credit, you might save hundreds or even thousands of dollars in interest charges each year, depending on how much you borrow. When you have a good credit score, you have some leverage with credit card issuers and lenders. You might be able to work a better deal – lower interest rate, higher credit limit – by pointing out that other creditors are clamoring for your business. Consumers with lower credit scores won’t get very far with this tactic. If you are in the market to rent an apartment or house, you’ll find that most landlords check out your credit history before offering you a lease. A good credit score requires a good credit history, which makes it much easier to pass muster and get the rental you want without wasting a lot of time trying to find a less choosy landlord. The rental story also applies to employment. All things being equal, it seems logical to assume that a prospective employer would prefer to hire a candidate with good credit rather than poor. If you have foreclosures or bankruptcies in your past, you might find potential employers less than enthusiastic about your resume. Move up to a good credit rating and you might qualify for lower car insurance rates, because insurers have found that folks with bad credit file more claims. You also might be able to open utility accounts or secure cell phone contracts without putting up a security deposit. The big three credit bureaus – Experian, Equifax and TransUnion – are good but not perfect. Mistakes can creep into your credit history and, if negative, can hurt your score. It’s up to you to request free copies of your credit reports and check them for errors. If you find any, you can write to the credit bureau and have them fix it. Removing derogatory mistakes will immediately increase your credit score. As mentioned earlier, a high credit utilization ratio will hurt your credit score. Pay off some debt, lower your ratio and watch your score rise. When your ratio is high, creditors fear that sudden financial challenges might push you into default. The credit bureaus account for this extra risk by lowering your score, which justifies lower credit limits and higher interest rates. You should not necessarily close accounts you no longer use – it won’t raise your score and may even lower it if it shortens your credit history. Use your personal financial software or electronic calendar to set payment reminders for your credit accounts. Paying on time, and paying more than the minimum, are good things and will improve your score – it shows that you have control over your financial situation. If you’ve already fallen behind on payments, get current and stay current. Credentialed counselors can give you individualized advice about how to raise your credit score. A counselor can go over your situation and point out several ways to improve your score. Use a reputable credit counselor, but be on the lookout for credit repair scams. These are fraudulent companies that charge up-front fees for services that you can accomplish yourself for free. In the worst cases, these scammers take your money but don’t lift a finger in your defense. If a company guarantees that it will remove correct negative information from your credit report, find another provider. If you are shopping for a loan, do so over a short period, say 30 days, because credit bureaus will treat all related credit inquiries within that period as only one. Too many inquiries lower your score. Bankruptcies can hurt your credit score for up to 10 years. Foreclosures, collections, and defaults also cause multi-year damage to your score. Before resorting to these measures, try to explore alternatives. For example, work with your bank to avoid foreclosure by arranging for a short sale of your home. A short sale, which might be less harmful to your credit score, is an arrangement in which the lender reduces the homeowner’s debt in exchange for a swift sale of the property. Negotiate terms with a creditor that will allow you to avoid collection on a past-due debt. If you’re in a hole, stop digging. Don’t take out more debt than you can comfortably handle. A credit utilization ratio above 30 to 40 percent will hurt your score. Too much debt is also indicated by an inability to pay on-time or to pay only the minimum amounts month after month. Payments that are overdue by 90 days or more will certainly hurt your score, but some lenders report missed payments sooner, and these can hurt too. Every time you apply for credit, you generate a “hard pull,” or inquiry, on your credit report. As mentioned above, multiple pulls will be aggregated if they occur in a focused period. However, if you are frequently applying for credit, your inquiries will mount and reduce your credit score. Note that rental and employment applications also generate hard pulls. An old shell game involves constantly moving debt from one account to another in order to gain some time before repaying. Credit bureaus become aware of this type of abuse and penalize your scores accordingly. This can really kill your score until you fix it. Some credit card issuers alert you to unusual activity, but in any event, you should carefully review your monthly statement and report unrecognized charges right away. Then check your credit reports. You can ask the credit bureaus to freeze you accounts to prevent further damage, and then work with them and the credit card issuer to have fraudulent charges removed. There are a few firms that promise assistance should identity theft occur, but there is no company that guarantees prevention of ID theft. Time heals all wounds, or so they say. It’s hard to have a chipper attitude when your credit score is mired in the subprime range despite your efforts to raise it. The message is: Have faith! It might take 6 to 12 months to start seeing results, but if you do all the right things, your score will rise. Even before negative items roll off your report, their impact erodes with the passage of time. The reason being that old data is less predictive of creditworthiness. For example, a missed payment could cause your score to tumble, but recovery might occur in as little as one and a half years. By the way, the initial impact is worse for folks with high credit scores, since it indicates a departure from previous form. Therefore, it takes longer for negative items to lose their sting if your credit score had been excellent or good. Minor infractions can lose their punch within a year. These include maxing out a credit card, closing an account, and obtaining new credit. However, if your credit score was high before the negative event, the recovery period might stretch out over two to three years. A major negative event might cause you to throw up your hands and give up, but it’s a much better idea to get back into the game by taking small positive steps. For example, you can open a credit-building account with a credit union, in which you borrow money, deposit it into a savings account, and then repay the loan over a year or more. This won’t cause major items to expire any sooner, but it will add a positive aspect that will partially offset the negative impact of the derogatory item. The point is to take helpful actions to accelerate the recovery process. Simple steps, such as paying on time, paying off old balances, and avoiding new credit, will help you bounce back from unfortunate items in your past. Why Does Having a Good Credit Score Matter? After the mortgage meltdown of 2008, banks rolled up the red carpets they had previously extended to consumers with fair and poor credit. The granting of undocumented mortgages to subprime borrowers was a major contributor to the Great Recession, so it’s understandable that lenders reacted violently by cutting off credit to all but the most creditworthy customers. This was one of the instigators for the P2P loan market’s ascendency soon thereafter. In the last few years, banks have somewhat loosened their underwriting standards. Nonetheless, it is still much easier to get a loan if you have good credit. Naturally, a good score also gets you a good interest rate on loans and credit cards. Many employers, especially medium to large corporations, check the credit histories of candidates for employment. A good credit score equates to a good credit history, meaning no large derogatory items such as bankruptcies, foreclosures, collections, or defaults. A human resources department is likely to look askance at candidates with bad credit. A good credit rating shows prospective employers that you have the ability to live within your means and manage your finances responsibly. In other words, you’re just the kind of person who’ll get the acceptance letter, and someday, the corner office. There are two ways for insurance companies to prosper. The first is to accept government subsidies. The second is to set premiums commensurate with risk. In the automobile insurance market, studies show that drivers with bad credit scores are more likely to file claims. We can speculate as to why this correlation exists, but more to the point is that you benefit by getting lower premiums with a good credit rating. You might be able to save hundreds of dollars over the life of the vehicle just by raising your credit score. Banks and other lenders consider many factors when mulling over a small business loan application. One important factor is the credit history of the owner. Even if you have a great business idea, banks and other lenders will shy away if you’ve driven previous companies into bankruptcy or have a poor credit score. Some commercial lenders might offer you a loan if you have bad credit, but the interest rate will be high and you might have to put up a substantial amount of collateral. You also might have to find a cosigner. You can avoid these indignities by maintaining a good credit rating. Landlords have enough worries without contending with deadbeat tenants. It’s a hassle, and expensive, to evict non-paying tenants, which is why landlords screen potential renters by checking their credit scores, credit histories, and criminal backgrounds. Likewise, utilities tend to be risk-averse, and will usually require a deposit to get an account if your credit score is less than good — although in truth, some will demand one either way. Attaining and maintaining a good credit score is a valuable defense against entities that have arbitrary power over our lives. What are the Three Credit Scoring Bureaus? The three major credit scoring bureaus – Experian, Equifax and TransUnion — collect financial information about consumers, maintain credit histories and calculate credit scores. Each offers its own scoring system in addition to standard FICO scores. All three are regulated under the Fair Credit Reporting Act, which requires them to provide free copies of a consumer’s credit report at least once per year. You can buy additional copies of your credit report, your credit score, and credit monitoring services from the credit scoring agencies. Chicago-based TransUnion was founded in 1968. It employs 4,700 people and, in 2016, generated a revenue of $1.705 billion. It markets credit reporting services to the public. TransUnion’s credit score is called VantageScore (VS), which was jointly created and used by all three credit reporting agencies. VS versions 1.0 and 2.0 use a score range of 550 to 990, which might be confusing for those used to FICO scores. For example, a FICO score of 675 is fair, but it’s a poor score under VS. The difference in the scores reflects different factor weights used by VS. For example, FICO weighs payment history at 35 percent and amount owed at 30 percent. The analogous weights for VS are 32 and 23 percent, respectively. Version 3.0 of VS adopts the 300-850 scoring range used by FICO. TransUnion and Equifax were fined by the CFPB in January 2017 for false advertising regarding the usefulness and cost of their products. TransUnion had to pay $13.9 million in restitution to customers and $3 million in fines to the CFPB. It agreed to adopt truthful marketing practices, obtain informed consent before enrolling customers in a paid subscription program, and provide an easy cancellation mechanism. Founded in 1996, Experian is a worldwide information services company headquartered in Dublin, Ireland and Costa Mesa, CA. The company has 17,000 employees and generated $4.55 billion of revenue in 2016. In addition to the shared VantageScore scoring system, Experian’s proprietary system is called Experian PLUS (EP, roughly equivalent to FICO) with scores ranging from 330 to 830. EP scores require some interpretation, because two consumers with the same score might have different degrees of creditworthiness. Therefore, the Experian credit report should be used in conjunction with EP scores. In March 2017, Experian reached a $3 million settlement with the Consumer Financial Protection Bureau over charges that Experian misled consumers about its scoring system. The CFPB accused Experian of saying its scores provided the same type of information that lenders use to assess credit. In fact, EP and FICO scores sometimes varied substantially from each other. Experian changed its practices in 2014 and said it was now in compliance with existing rules. In 2015, Experian was hacked and up to 15 million customers may have had their data stolen. This company’s roots go back to 1899. It has 9,500 employees and 2016 revenues of $3.144 billion. Atlanta-based Equifax maintains data on more than 800 million consumers worldwide, as wellas 88 million businesses. Equifax Credit Score is the company’s proprietary scoring system. It has a different range (280-850) than FICO’s, and uses a different calculation. In January 2017, the Equifax reached a settlement with the CFPB to pay $3.8 million in restitution to customers for selling deceptive credit scores and for falsely claiming that its credit-related products were free during the period of July 2011 through March 2014. Equifax pitched a “free” credit monitoring program, but only the first month was free. Subsequently, consumers were charged $16/month. This arrangement was not adequately disclosed to the folks that signed up. In another action, Equifax was sued and found guilty in July 2013 for failing to fix the plaintiff’s credit report despite numerous attempts. The faulty credit report caused the banks to deny credit to the plaintiff. The jury assessed an award of $18.6 million, which was the largest of its kind as of that date. The trial uncovered the fact that Equifax sent complaints to a subcontractor in the Philippines. What is the Most Common Credit Score? FICO is, without a doubt, the leading credit scoring system in the U.S. FICO is used by 90 percent of businesses that rely on credit reports. FICO actually offers several credit scoring schemes. The one discussed in this article is FICO-8, which is the most popular alternative for consumers seeking credit and mortgages. Some industries use different variants. For example, purveyors of auto loans and leases tend to use FICO Auto Scores, an industry-specific product. FICO-9 is the most recent update to FICO credit scores. It contains a few technical differences with FICO-8 having to do with the impact of delinquent medical bills and paid collections. FICO-9 reduces the impact of medical debt collections because of their often-sudden nature. The new scoring system also negates the impact of collections once they’ve been paid, a move that rewards consumers for paying off old debts. What is the Average FICO Credit Score in the US? The latest research by the Fair Isaac Corporation, reflecting data as of March 2017, reports that the average U.S. FICO score is 699 on a scale ranging from 300 (the worst score) to 850 (the best score). Experian’s average VantageScore 3.0 is 669, using the same scale range as FICO’s. The average FICO score is at an all-time high, indicating a healthy consumer credit picture in the U.S. The 26-point difference between the two averages reflects the different methodologies used by the two providers to calculate and assign meaning to their point systems. These differences are somewhat technical, but the most important thing to keep in mind is that credit applications are usually evaluated using FICO, whereas the credit reports available from the three major consumer reporting agencies use VantageScores. To achieve the average FICO score, you need to avoid actions that would drop your rating, such as bankruptcy, too many delinquent payments, being sent to credit collection, overextended credit, and so forth. Thankfully, the impact of negative information fades over time. Almost 20 percent of the population has a FICO score of 800 or above, and about 55 percent are above average. What is the Highest and Best Credit Score Possible? The best score for FICO and VantageScore 3.0 is 850. Earlier versions of VantageScore topped out at 990. While it is possible to get a perfect score, it’s rare and overkill. Any score in the 800’s is elite, and opens up just about all avenues to credit. One thing to keep in mind is that credit scores are constantly updated, and therefore a little jittery. Your score is a snapshot in time, and it’s not surprising for it to vary by 10 or 20 points over the course of a year. Even if you hit the 850 jackpot for FICO, your VantageScore might be lower. In this article, we’ve defined the concept of a good credit score, explained how to achieve it, told you about conditions that can threaten it, and emphasized the importance of attaining it. Whatever your score, it’s important to manage your finances responsibly and to live within your means.